•KAFUBU Dam where the Ndola boating club is situated. 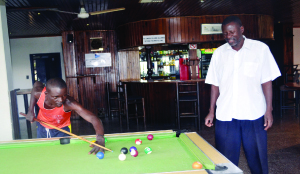 (Inset) Boating club senior man, Milner Simukonda (standing) and a patron Mwewa Chanda playing pool in the club lounge. Pictures by YVONNE CHATE. THE Ndola boating and sporting club, which has been in existence in Ndola for 56 years, is set for revival when the ongoing renovations are concluded. Boating club senior man, Milner Simukonda said the sole boating facility, near the town centre in the provincial headquarters, would soon roar back to life. Simukonda told the Copperbelt Times that the club’s board had partnered with Kafubu Water and Sewerage Company (KWSC) and the district administration to clear the Kafubu dam. He said the board, with support from KWSC, would clear the dam in a bid to open up the area to members of the public for water sports. After the renovations, the club would be working towards introducing new sports at the facility, situated near the Zesco motor vehicle workshop on the banks of Kafubu River. 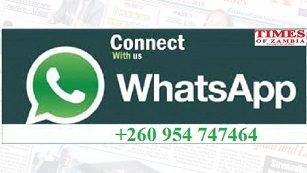 Simukonda said KWSC and the district administration, led by Ndola District Commissioner Rebby Chanda, was set to open up the boating and sporting club to the public for water sports once renovation was completed. “KWSC and the district administration will ensure that the boating club is open to the public before mid-next year, so the board wants to ensure that the facility is renovated as soon as possible,” he said. Simukonda said the club closed the boating facility because Kafubu dam was choked with mud and could not accommodate water sports. “The dam was full of mud which was making it difficult for boating sports such as water skiing and water polo to take place,” he said. He said KWSC would clear the dam using the dredger which was procured by the provincial administration. Simukonda said when the club is opened to the public, it will also offer sports like volleyball, swimming, darts, and pool, alongside the water sports. He said the club will also revive the gymnasium once a trainer was found. The boating club, which has 210 members, will be renovated with funds from OX Drilling, Sundowner, and Bwana Mkubwa Mine. And the district commissioner, who said the district administration had formed a fundraising committee, disclosed that the club would need more than K24, 000 to clear the Kafubu dam. He said so far, the committee had raised less than a quarter of its targeted funds needed to clear the dam, but was optimistic that everything would soon be in place.